Kaua‘i Police Department officers perform a search near Kamalani Bridge on a man they had just arrested at Kitchens Beach Tuesday afternoon. A car chase on Election Day ended with an arrest at Kitchens, a popular surf spot behind Wailua Golf Course. At about 4:30 p.m. Tuesday, a small grey-colored pickup truck with an extended cab plowed into the sand just past Kamalani Bridge. A Kaua‘i Police Department patrol car following closely behind stopped a few feet from the truck, and a foot chase ensued. Two additional patrol cars drove at high speed through the campsite and stopped right before Kamalani Bridge. An emergency response vehicle and a Kaua‘i Fire Department truck arrived at the area shortly thereafter and parked at the campsite. Schoolchildren — still wearing their school uniform — playing on the bridge said they witnessed two officers chasing on foot an occupant of the truck. 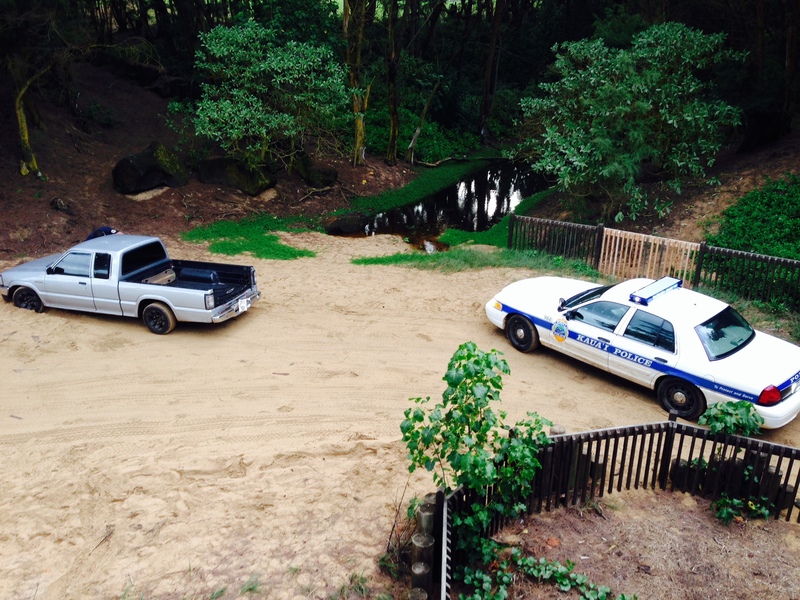 One officer ran through the woods, while the other ran on the sand. 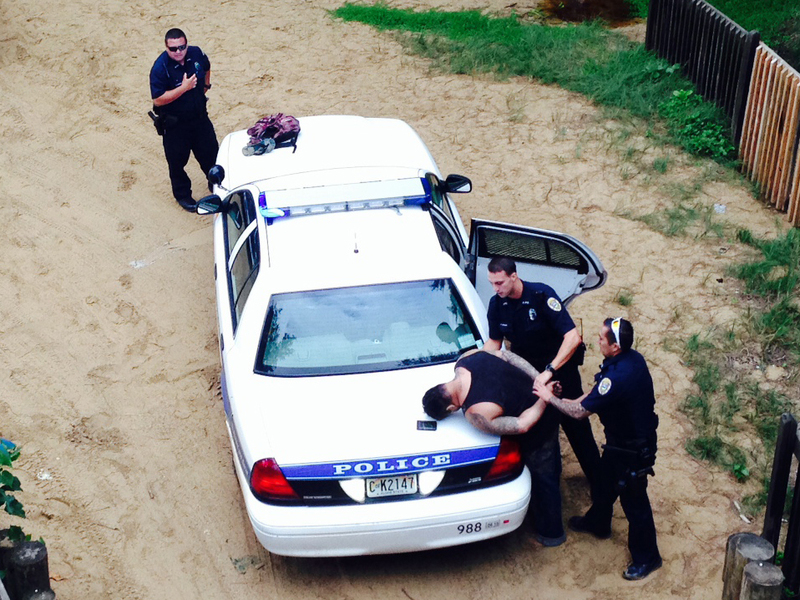 Within minutes, the officers arrested the suspect at the beach, handcuffed him and brought him back to Kamalani Park. The suspect’s vehicle plowed into the sand just past Kamalani Bridge, after being chased by a patrol car. The large-built man had dark hair and several tattoos on his arms. He was wearing long, dark pants and a black tank top. An officer was carrying a backpack that appeared to belong to the suspect. The officers had the handcuffed suspect lay his chest on a patrol car’s trunk, so they could further search him. Meanwhile, teenagers at Kamalani Bridge pulled out cell phones and took pictures of the arrest. The suspect was put on the backseat of the patrol car before being taken away. On Thursday, a county spokeswoman confirmed the police made “an arrest for a no bail warrant,” but she was unable to provide additional information.